The [Sub Tool Detail] palette displays when [Window] menu → [Sub Tool Detail] is selected. The [Sub Tool Detail] palette allows you to edit the selected sub tool settings in more detail than the [Tool Property] palette. The [Sub Tool Detail] palette also displays when [Sub Tool Detail] on the [Tool Property] palette is clicked. Select the category of the item to configure. Previews the stroke of the sub tool being configured. Configure items to be displayed on the [Tool Property] palette. Turned on items can also be adjusted from the [Tool Property] palette when the sub tool with configured settings is selected. Clicking the button displays a menu that allows you to copy the setting values or showing status to other sub tools. The configured value is not displayed for indicator display. To view the currently configured value, click the trian­gular icon on the right side of the indicator. Configure the sub tool settings in detail. Items that can be configured vary depending on the selected tool and sub tool. 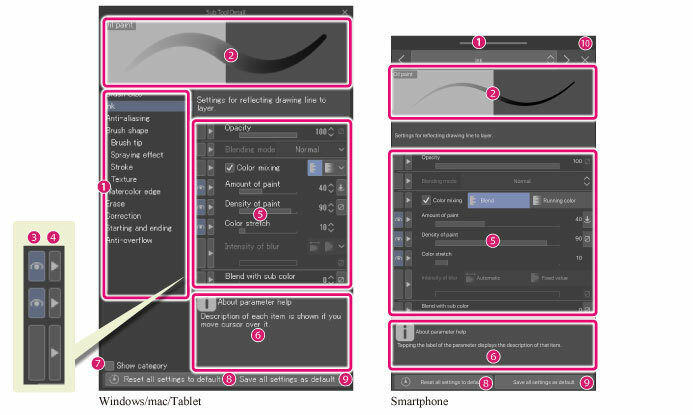 For details on the items, see "CLIP STUDIO PAINT Tool Setting Guide". Displays setting tips, preview of the settings and the like. Depending on the selected category, the palette height may need to be increased for settings preview to display. When turned on, displays category division lines on the [Tool Property] palette. Restores the settings of the selected sub tool to their initial values. Registers the settings for the selected sub tool as its initial settings.